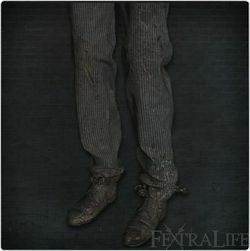 Student Trousers is a Leg Armor/Attire in Bloodborne. It is part of Student Set.
" Uniform of the students of Byrgenwerth, a bygone institute of learning. The Healing Church has its roots in Byrgenwerth, and naturally borrows heavily from its uniform design. The focus not on knowledge, or thought, but on pure pretension would surely bring Master Willem to despair, if only he knew."